Do you have an upcoming wedding, an anniversary or another special party that you want to make memorable? Renting a chocolate fountain is a great way to make the event a bit more exciting. Many companies give you such options. All that you have to do is choose the right equipment. Most companies will consult you and give you suggestions about renting the right chocolate fountain variety. The capacity of the fountain and the number of guests will have to be coordinated, if you want to make sure that everyone will get to enjoy the sweet temptation. Most companies that offer chocolate fountain rentals have a number of models and possibilities that their customers can choose among. The price of the rental will depend on the size of the fountain and its functions (regardless of the number of hours that you’ll need the equipment for). The first thing to examine is the material that a chocolate fountain is made of. The best equipment in the niche is made of quality and durable materials like stainless steel. Stainless steel chocolate fountains are also relatively easy to clean. The heat settings are also important. The heat at which the fountain operates will depend on the type of chocolate you plan to use. White chocolate requires a lower temperature than the milk and dark varieties. A good chocolate fountain should also be silent. Some of the larger varieties can be quite noisy and their operation will be disturbing. Look at a few additional characteristics like adjustable feet that enable levelling, a removable basin for easier cleaning in the end of the party, an auger-style pump that improves the flow of the chocolate and a particular number of tiers (that will fit in your party concept). Keep in mind that most caterers that also have chocolate fountains will be responsible for the assembly and the cleaning of such equipment. Going for a catering company that has a chocolate fountain will save you from all of the trouble that you’ll otherwise have to go through in order to get the appliance ready for use. Rent a Fountain or Buy a Fountain? You may be wondering whether renting a chocolate fountain is a good idea because you can buy one and keep on using it forever. 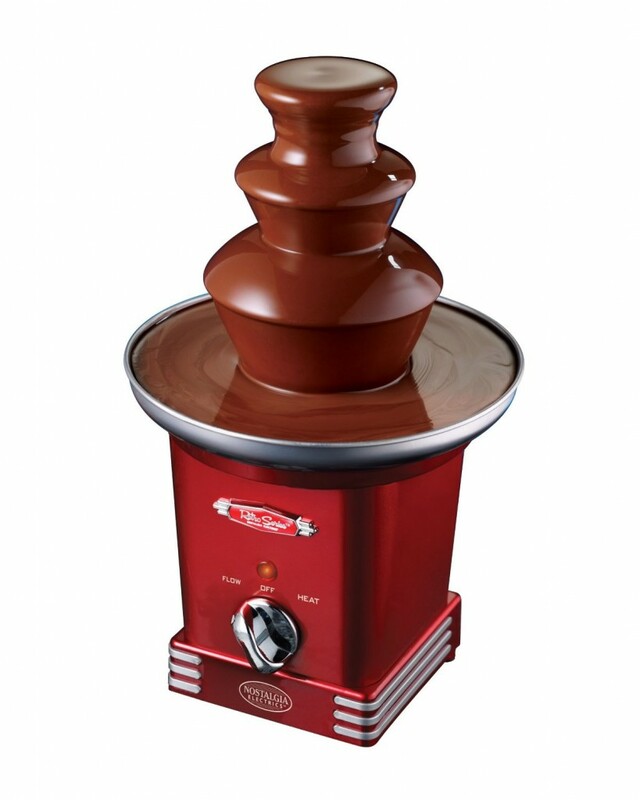 For large celebrations, like a wedding, renting a commercial chocolate fountain will be the best idea. This is a large piece of equipment that can hold enough chocolate for 300-400 guests. Medium-sized fountains should also be rented for parties that feature about 100 guests. The cost of such rentals is anywhere between 300 and 400 dollars. If you need a small fountain for your celebration, however, the best thing to do is to buy one. You’ll find numerous great chocolate fountains that cost less than 250 dollars. Some of these are made of high quality stainless steel and they feature three or more tiers. Others are even more sophisticated – they come with the already mentioned auger-style pumps, separate chocolate basins, thermostats and skewers included in the set. Getting a chocolate fountain for the party doesn’t mean that a chocolate sauce is the only thing you can use with the appliance. Regardless of their name, chocolate fountains are quite versatile and they can hold a number of unorthodox sauces/salsas. A chocolate fountain can also hold cream cheese frosting, maple syrup, ketchup (great for a barbecue party), nacho cheese, ranch dressing and barbecue sauce among many others. Make sure that the viscosity of the sauce or the condiment is the right one. If the liquid is too thick, the pump wouldn’t be capable of getting it to flow through the tiers. Some of the condiments like ketchup and nacho cheese will have to be thinned before use in a chocolate fountain. If you decide to rent a chocolate fountain, make sure that the caterer is a reputable one. The company should operate high quality equipment and offer comprehensive services. For smaller parties and family gatherings, however, buying your own chocolate fountain will be a better idea. These appliances are quite affordable and with proper maintenance, they can be used during social gatherings for years and years to come.